Most people know that, with most purchases, you get what you are willing to pay for. The same is true with apartments, which are one of the most important things we spend money on. The quality of the apartment we rent influences our health, happiness, and well-being. For those of us who want the highest possible quality of life, I’ve compiled a list of apartment complexes in the metropolitan area with units that rent for more than $1,000 per month. Visit them and you’ll see that you really do get what you’re willing to pay for. 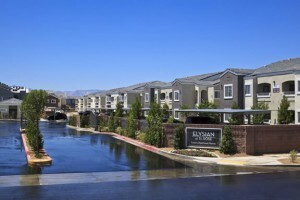 All units here have 2 bedrooms and range from 1,185 – 1,275 square feet in size and offer views of both the mountains and the Las Vegas Strip. With 1-, 2-, and 3-bedroom units that range from 770 – 1,172 square feet, this property has beautiful landscaping and is near everything you could need. The professional management team here will greet you with a warmth and graciousness that is an automatic plus when considering these 1 – 3-bedroom units ranging from 720 – 1,253 square feet. The granite countertops are my favorite part of these 1-, 2-, and 3-bedroom units that range between 563 – 1,211 square feet. When I first called Sahara Palms, I asked about their pet policy. The response: “We love pets!” These spacious floor plans range from 660 – 1,440 square feet. If I had to recommend a single one of these apartment complexes to you, I’d be hard pressed to name just one. They are all in great locations near restaurants, shopping, groceries, and public transportation. They are all well-maintained and have high-quality construction. They each have friendly, professional staff, and they’re all roomy and spacious. In order to find the one that’s perfect for you, unfortunately, you’ll have to visit each one yourself. Block out a Saturday afternoon and head out to find the perfect apartment rental in Las Vegas. Print out this article and take it with you so you can make notes as you visit each place.